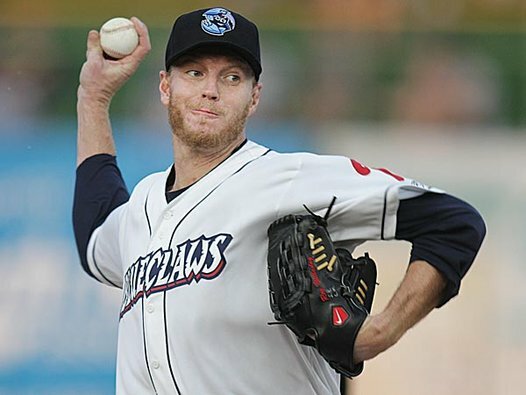 Hey kids, Roy Halladay pitched in another rehab start last night, this time in Lakewood, Zoo Jersey. And while I wish I could say it was nothing but face-breaking and SO CUTTEREDS, we'll have to settle for his arm feels good and didn't asplode. "HI RICK BIG FAN THANKS FOR THE POST BUT WHAT WAS THE LINE I NEED TO KNOW I NEED TO KNOW TELL ME ZEE DUB ARRRR CUZ I NEED TO KNOOOOOOOOW!" The caveat (solace?) I'll offer-- as a wholly unbiased voice on the matter-- is a big one: Our hero had shoulder surgery three months ago! That his arm feels good is the key. While Halladay's superhuman, it was perhaps a bit unfair to expect pinpoint control and increased velocity in his first 11 innings of rehab work. So keep positive, yo. When I was a freshman at the Univ of Maryland, I lived in HAGERSTOWN HALL which was a total shitbox and smelled like fried clams, but I did occasionally see chicks on my floor in only their towels so that was kinda cool and sort of worth the 35K a yr.
Get well soon, Roy. Also can you please write more posts about Roy Rogers thx big fan thx.